1. Oil prices up on Iraq concerns: The price of crude oil on the Nymex is rising by roughly 1% this morning and has been on an upward trajectory for the last few days. Commodity experts are worrying about how developments in Iraq could affect the oil market. An al Qaeda-inspired militant group called ISIS has taken over large parts of Iraq, including the country's second largest city. This is creating nervousness among commodity traders as they consider how this could affect the country's large oil-producing areas. 2. Stocks pause ahead of World Cup: U.S. stock futures were relatively steady and making slight gains ahead of the opening bell, after markets broke their recent winning streak Wednesday. The violence in Iraq could be making some investors nervous. "[The situation in Iraq] isn't enough to derail the global risk rally that has been fueled by so much monetary accommodation ... but it is enough to trigger some position-trimming and a pause," said Kit Juckes, a strategist at Societe Generale. Still, many are likely to be more interested in the World Cup, which begins at 4 p.m. ET. The tournament in Brazil is expected to be the most watched sporting event ever, and Americans are becoming increasingly interested in the game. 3. Stock market movers -- Lululemon, Restoration Hardware, Michael Kors, Exelon, Infosys: Embattled retailer Lululemon (LULU) is scheduled to release quarterly earnings before the market open. Lululemon shares plunged by more than 10% in premarket trading Thursday, the day after Chip Wilson, the yogawear company's founder and largest shareholder, said he voted against the re-election of two of the company's board members. Restoration Hardware (RH) shares soared in extended trading after the company reported earnings that beat analyst expectations. Meanwhile, shares in fashion house Michael Kors (KORS) were rising ahead of the open and Exelon (EXC) shares were under pressure. Also, Infosys (INFY) shares were slipping before the bell on news that a new CEO was appointed to lead the IT services company. 4. 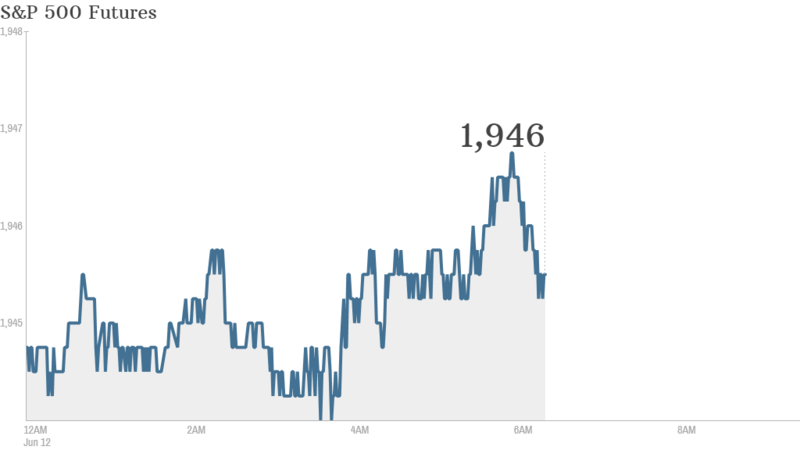 A deluge of economic data: Investors will be greeted by a variety of economic news Thursday. At 8:30 a.m. ET, the U.S. Department of Labor will release its weekly report on initial unemployment claims, and it will also release monthly data on import and export prices from May. At the same time, the U.S. Census Bureau will release May's retail sales numbers. 5. Mixed international markets after U.S. drop: European markets made mild gains in morning trading. Asian markets mostly closed with losses, though Indian markets were buoyant. In the last trading session, the Dow Jones Industrial Average, S&P 500 and Nasdaq all fell, breaking a consistent winning streak.